Ocracoke Inlet is located at the southern edge of the Outer Banks, separating Ocracoke Island from Portsmouth Island and its Cape Lookout National Seashore neighbors. One of the oldest inlets on the entire coast of North Carolina, Ocracoke Inlet is a renowned destination for fishermen, beachcombers, birders, nature lovers, and plain old beach lovers. For an incredible view of the open water, or to experience the Outer Banks from an other-worldly, edge-of-the-earth perspective, consider taking a drive to Ocracoke Inlet on your next southern Outer Banks vacation or Ocracoke Day Trip. 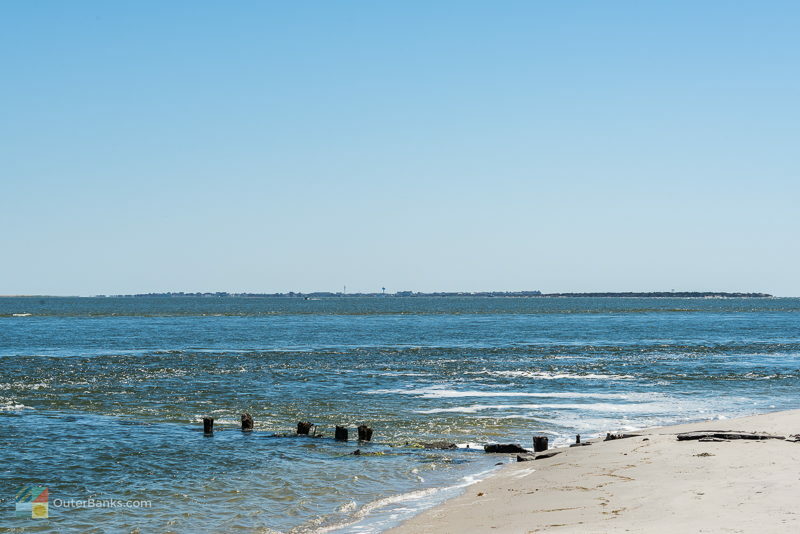 Beautifully wide open, with miles of beaches on the soundside and oceanside to explore, Ocracoke Inlet is an almost hidden gem that beach lovers would be remiss to pass by. Ocracoke Inlet has a stormy past, which is belied by its calm appearance and wide stretches of ever-changing beaches. It is, in fact, the oldest inlet on the Outer Banks, with a history that dates back well before the first European settlers discovered the coastline. It was even an entry point for the very first English settlers who drifted through in 1585 en route to their final settlement on Roanoke Island in present day Manteo. Even then, the expedition leaders noted Ocracoke Inlet's potential, as the vast waterway provided a safe and mostly easy-to-navigate waterway flowing into the Pamlico Sound, and eventually to the mainland towns of Bath and New Bern, two of North Carolina's oldest and most populated early towns. As more and more settlements popped up along the North Carolina coastal mainland, Ocracoke Inlet's usefulness grew, and soon the little beach and soundside areas that bordered the open water were stocked with a thriving community of traders, ship builders and ship repairmen, and all the services to accommodate the folks passing through. This community of tradesmen was established on both sides of the inlet, with Ocracoke housing a hardy population, and the now-deserted Portsmouth Island, for a time, being one of the most populous settlements on the Outer Banks. In the early 1700s, however, the thriving trade and innumerable goods that were always snaking in and out of Ocracoke Inlet attracted another breed of sailor as well -the pirate. By the 1710s, Ocracoke Inlet had become notorious as one of the most dangerous entryways to the mainland on the Eastern Seaboard. This wasn't because of the shifting shoals or the occasional squall, but because a steady stream of pirates began to flock to the area for the easy pickings and rich rewards. Ocracoke Inlet is essentially bordered by barrier islands, after all, as well as a series of smaller, less imposing islands. Because of this, pirating along Ocracoke Inlet was an easy job. All a pirate had to do was attack a ship about to pass through, and then take to the secluded waters bordering the soundside of the barrier islands, where they were virtually hidden from the ships searching for them along the oceanside. With the waters at their disposal, a number of famous pirates passed through the area for a few days or even a few weeks, including Calico Jack, Anne Bonney and Mary Stede, (the most famous female pirates), but perhaps the pirate who left the longest lasting impression was Edward Teach, or Blackbeard himself. Blackbeard was essentially one of the Outer Banks' first fans, and he set up a temporary home on Ocracoke Island, and a second permanent home across the inlet and the Pamlico Sound in Bath, NC. (In fact, legend has it that Blackbeard's "vacation cottage" in Bath was located right next to the North Carolina Governor's house.) When Blackbeard wasn't relaxing on the mainland, he was trolling the waters of Ocracoke Inlet and looting at will. This went on for several years until the British government finally stepped in and sent sloops to put Blackbeard's reign over the inlet to rest. On November 22, 1718, Blackbeard was killed in a battle on the water in the now-named Teach's Hole, just hundreds of yards away from the inlet. With the defeat of Blackbeard and the increased presence of British Royal Navy ships lurking around the inlet, piracy eventually dwindled and the ports located on both Ocracoke and Portsmouth Islands were once again free to thrive. This continued for decades, and the inlet even played a key role during the Revolutionary War as a waterway for supplies to assist General George Washington. Ocracoke Inlet and the towns that bordered it were well on their way to becoming the most popular locales on the Outer Banks, but then the inlet was affected by two outside factors. Two additional inlets opened up on the Outer Banks, Hatteras Inlet and Oregon Inlet, creating competing ports while causing the Ocracoke Inlet to fill up and become too shallow and hazardous for larger ships. In addition, ports located further south in North Carolina, specifically along the Cape Fear River, began gaining momentum and popularity in the local shipping industry. These two factors combined to slowly and irreparably end the shipping industry along Ocracoke Inlet, and caused major blows to the population of the communities on Ocracoke and Portsmouth Islands. Portsmouth, as it turns out, would never recover and is now a ghost town and an incredible albeit out of the way Outer Banks attraction. Ocracoke, on the other hand, would become a popular vacation destination for fishermen and beach lovers alike, a distinction that still remains today. Ocracoke Inlet effectively serves as the border between the Cape Hatteras National Seashore and the Cape Lookout National Seashore, and at 1 mile across, (which changed daily depending on the tide and weather conditions), it is one of the shorter inlets along the Outer Banks. The waters within the inlet are an even-changing mixture of sandy shoals, deep channels and small, marshy islands or desolate sandbars that appear and reappear with every incoming tide. On the northern side of the inlet, the Ocracoke beaches that border the inlet range from wide oceanfront parcels to small soundside patches of sand, both of which are occasionally cut by tidal pools or small channels of saltwater. On the southern border on Portsmouth Island, the oceanside beach that borders the inlet is connected directly to a thick cluster of maritime forest, as well as the soundside Portsmouth Village. Either side is simply beautiful, and vacationers to Ocracoke or Portsmouth will find it's possible to stand at the edge of the inlet beach and look out across the water to the neighboring shoreline. As mentioned, Portsmouth is a deserted village that is open to the occasional visitor, while Ocracoke is a thriving fishing and tourism town, encompassed within 4 square miles, making it an amazing feat that 1 mile of water can cause such a separation in population. Arguably the biggest attraction along the inlet is fishing, whether it's from the beach, along the sound, or in the open waters of the Gulf Stream. A number of charter fishing boats can be found along the docks of the Ocracoke Harbor, as the location of Ocracoke Island and the inlet provides visitors with a quick and easy run to the Gulf Stream. 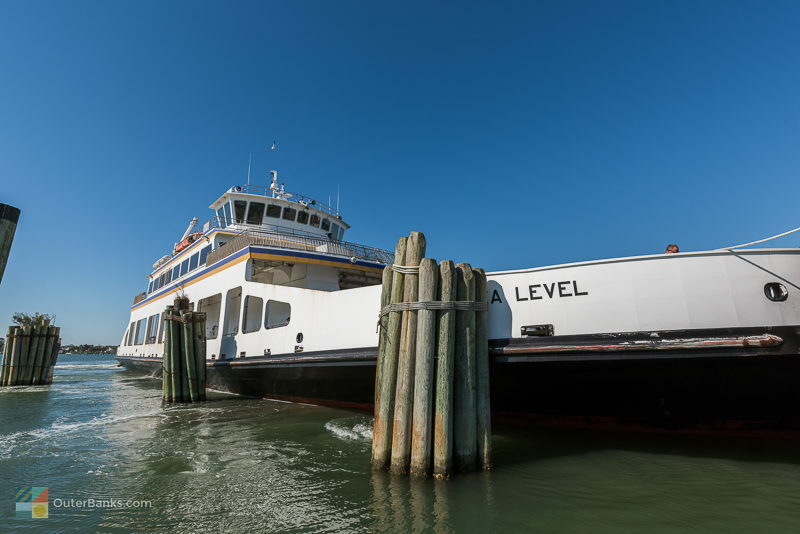 The harbor, after all, is located just a half mile or so away from the inlet itself, tucked away on the Pamlico Soundside, and as such, visitors will find it takes mere minutes to launch from Silver Lake and cruise through the Ocracoke Inlet waterway. Because of this, many Ocracoke Island visitors decide to book a half day or full day offshore charter, or even an inshore charter that cruises the waters just off the inlet in search of cobia, mullet, spot, croaker, and even drum. Ocracoke Inlet also provides one of the easiest routes to Portsmouth Island, and while there are no private ferries that can shuttle visitors across to explore the abandoned village, there is a touring company, Portsmouth Island ATV Tours, that departs from the Ocracoke Harbor daily in the summer season and skirts across the inlet to enable visitors to cruise through the island on an ATV. Of course, fishermen and explorers don't necessarily have to bring along a boat to enjoy Ocracoke Inlet. The fishing along the beaches is exceptional, particularly on the northern side of the inlet which produces some of the best surf fishing conditions on Ocracoke Island, and on a crisp fall day it's not unusual to see a dozen trucks lined up along the oceanside inlet beaches with their lines in the water. Because of the proximity to the inlet, and the surge of larger game species that come and go, surf fishermen can expect to reel in mullets, bluefish, croakers, spot, mackerels, cobias, and even drum, depending on the season. The spring and fall months are some of the most popular fishing times, as a number of migrating game species, (including red drum), are passing through the area on their long treks north or south. The Ocracoke Inlet beach can only be accessed by a 4WD vehicle, as located nearly 4 miles from NC Highway 12, (the only main road that spans across Ocracoke Island), it's a long trek from Ocracoke Island's borders to the oceanside inlet beaches. The route there is fairly smooth, however, with a beach access ramp located just outside of town which consists of hard, packed down sand, and which runs almost directly to the beach. Vacationers are advised that a beach driving permit is required to drive on the Cape Hatteras National Seashore, (which Ocracoke Island is a part of), and can be obtained at the National Park Service offices in Ocracoke, Buxton, and by Oregon Inlet. The beaches adjacent to Ocracoke Inlet on Ocracoke Island are also seasonally closed for endangered and / or threatened species nesting and breeding seasons, and are generally open from the late summer until the early spring. For more information on current closures, visit the Cape Hatteras National Seashore's website. On Portsmouth Island, a small boat or a vehicle is also required to visit the beaches bordering Ocracoke Inlet. Skiffs can anchor just offshore or at a small set of docks located at either end of Portsmouth Island, and vehicles can visit the "southern side" of Portsmouth Island by taking a privately run vehicular ferry across the sound from Atlantic, NC. Because the ferry deposits visitors on the northern end of Portsmouth Island, it's a 13 mile drive to get to the Ocracoke Inlet facing beaches. With this in mind, most folks who are interested in visiting Ocracoke Inlet are encouraged to do so via Ocracoke. While fishermen seem to make up the majority of Ocracoke Inlet's beach population, visitors will notice plenty of people with their heads down strolling along the waters as well. Ocracoke Island has always been nationally renowned as one of the best shelling beaches in the country, and a big part of this reputation is because of the beaches bordering Ocracoke Inlet. Here, visitors can find clusters of shells or massive shell piles washed up along the oceanside of the inlet, or small, hard-to-find treasures hidden under the soft sand along the soundside. It only take a few minutes to stroll the beach from the oceanside to the soundside, but along the way, the water changes drastically from choppy ocean breakers to small lapping soundside waves. In between lies an assortment of shells, from bleached sand dollars to Scotch Bonnets, olive shells to spiraling augers. Beachcombers, particularly in the off-season when the Ocracoke Inlet beaches are all but deserted, are encouraged to explore and keep a keen eye on the shoreline. With so many finds washing up on a daily basis, a shell hunter with a good eye is sure to return home with a treasure or two. Birders and wildlife lovers will also enjoy a trip to Ocracoke Inlet, as the unique combination of ocean beaches, sound beaches, and maritime forest and small salty marshes in between allows a diverse wildlife to thrive in the area. Perhaps the most famous residents are the American Oystercatchers, who flock to this area in droves and can be seen lounging beak-down in the sand, or skimming the waters in search of small bait fish and other morsels. In addition, birders can expect to see skimmers, terns, sandpipers, gulls, plovers, and even large masses of cormorants congregating along the inlet beaches. Other wildlife to look out for includes ghost crabs, hermit crabs, coquina clams, and brightly hued jellyfish that swim remarkable close to the beach. Sit back and enjoy the show, but be sure not to disturb your natural neighbors as several species, (particularly the American Oystercatcher), are protected, while other species, (like the variety of jellyfish), can cause a bad day at the beach. For a less active Ocracoke Inlet outing, simply break out the beach chairs, a good book, and enjoy the views. At the very edge of Ocracoke Inlet, visitors can just barely make out the silhouette of Portsmouth Village in the distance, and an afternoon of just quiet beach lounging can provide some fantastic vistas of the skiffs and charter boats passing by, the skimmers skirting across the water in search of bait fish, and even dolphin or porpoise playing in the waves close to shore. For a little beach watching at its finest, a long beach day bordering Ocracoke Inlet is pretty hard to beat. While it's fine to wade in the waters along the beaches, visitors are cautioned not to swim in the inlet. The currents across the inlet run so quickly and so deep that even the best swimmer can instantly be swept up with the water. Kayakers and stand up paddle boarders are also cautioned to steer clear, as the fast moving waters and constantly changing tides and sand bars make the trip across a dangerous route. 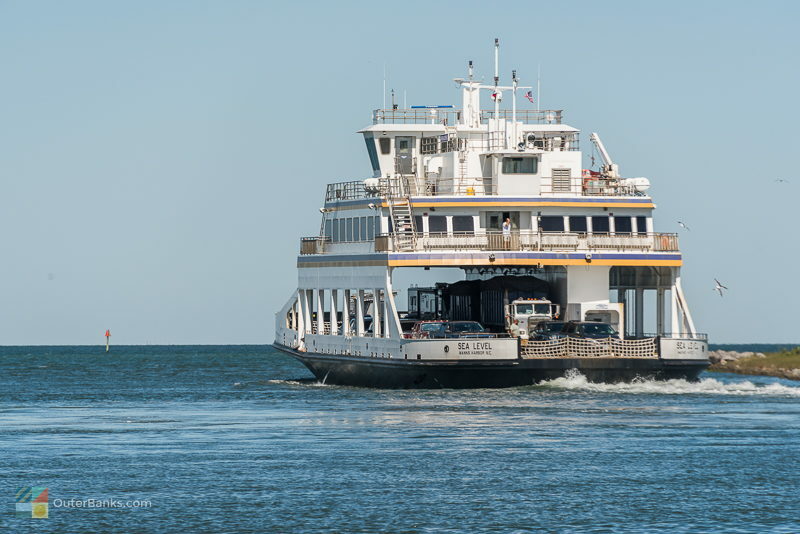 The best way to tour the inlet and island hop from Ocracoke to Portsmouth is via a small skiff or other motorized boat, which can make a quick run from one harbor to the other. Summer visitors should be sure and bring sunscreen as well as bug spray. Ocracoke and Portsmouth are both well-known for their mosquitos, and Ocracoke's beaches also occasionally have green heads, which are larger fly-sized bugs that leave a slightly painful and itchy bite behind. The good news is that these bugs are generally seasonal and are all but gone in the off-season months, and a little bug spray in the summer typically keeps them at bay. Be sure and use a 4WD vehicle to access Ocracoke Inlet. While the beach ramp that leads to the beach is seemingly packed down and easy to travel, as soon as the access route reaches the sand, the "road" becomes much softer and very easy terrain for a vehicle to get stuck in. Slack your tires down to 15-20 psi before heading out, and bring a shovel or a tow rope along just in case. Interested in finding some prize shells on your Ocracoke Inlet trip? Don't be afraid to dig. The areas of shoreline that are literally located a foot or two into the water are some of the best areas to find unearthed treasures, including whole sand dollars and picture-perfect whelks. Use your toes as you wade through the water to dig and see what lies just beneath the surface - just be on the lookout for blue crabs and jellyfish that make appearances in the area. Because the trek from the beach access ramp to the inlet is a long one, visitors should bring plenty of food, beverages and supplies along to make sure they can enjoy as much time as possible on the beach instead of making trips back and forth from Ocracoke village to load up on supplies. Luckily there are a handful of convenience stores and grocery stores within just a half mile of the ramp that specialize in easy, portable grub to bring along to the beach, including sandwiches, chips, snacks, beverages, and even hot pizza. Bring the cooler along, because Ocracoke Inlet is an ideal destination for an impromptu beach picnic. Ocracoke vacationers who make the trek to the beaches surrounding Ocracoke Inlet will be rewarded with great fishing, great shelling, and fantastic wide open views of the inlet, as well as neighboring Portsmouth Island. Ocracoke Inlet, after all, is one of the first attractions on the Outer Banks, luring European settlers to create substantial developments along the North Carolina coastline. Over the centuries, Ocracoke Inlet served as a shipping waterway, a breeding ground for piracy, and an access point for fantastic Gulf Stream and surfside fishing. On your next Outer Beaches vacation, why not see what lured adventurers and entrepreneurs to the Outer Banks for generations? Take a trip back in time, and enjoy fantastic shelling, fishing, and wildlife to boot with a trip to the beaches of Ocracoke Inlet. After a full beach day of incredible views and miles of privacy, chances are you'll be completely hooked.